Isn’t this the most adorable Pomeranian photo you’ve ever seen? The valentine beanie hat adorning it’s head is by Eternal Light Shop is just too precious for words! The hat ties under the dog’s chin and obviously makes for some great photo opportunities. 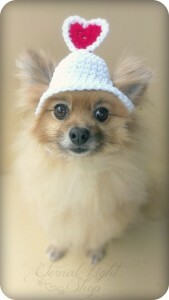 The owner Priscilla uses the best quality 100% acrylic yarn and can customize the hat in different colors and sizes. She has been crocheting since she was 12 years old, and puts a lot of love into each piece she makes! 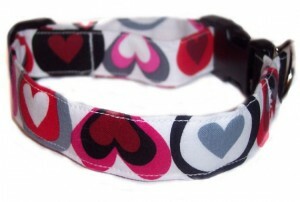 Cute, cute heart collar for your beloved dog is by Etsy seller BowWow Store. Definitely both paws up for this one! Custom made in various sizes, this collar features a quick release side accent buckle, wide mouth nylon slip lock buckle and a heavy weight nickel plated D-ring to attach to your pets leash. The collar is sewn on a industrial sewing machine using the strongest thread available. A matching leash in available for some collars. BowWow Store has been selling collars and other pet products at dog shows and craft fairs in the northeast for the past 10 years. Happy Valentines Day!! 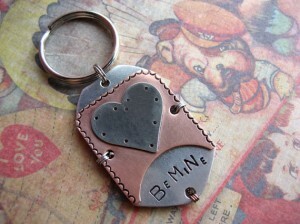 Great “Be Mine” metal dog tag by Woo Woo Workshop should get your pooch plenty of love! The “Juliet” Woo Woo Tag™ is the shop’s newest design with triple layered metal. Made of a soldered nickel silver heart onto a scalloped copper plate with two layers of lightweight aluminum, the design just begs to be touched. The tag has an aluminum contact backer with space for adding pet name and contact information. Be sure to visit both Melissa’s Etsy site and her beautiful blog to see all of her unique handmade designs. The tag is ready for wear right out of the package, and is sealed with clear polyurethane for protection. Woo Woo Workshop guarantees that your pet will have the coolest tag on the block. Love is in the air! This entry was posted in Etsy, Pets and tagged beanie, BowWow Store, crochet, dog collar, dog tag, Eternal Light Shop, Etsy, Etsy Friday, hearts, love, pomeranian, Valentine, Woo Woo Workshop. Bookmark the permalink. much love and Happy Valentine’s Day!